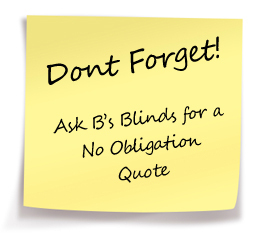 B’s Blinds of Stafford have just launched their brand new website. It is set up ready for us to keep you all up to date about new lines, products and services as well as any special offers or sales. Please feel free to visit our customer testimonial section, we’d be glad to received your feedback, it helps us to give continued customer satisfaction. Just a little note to tell you we are delighted with the blinds in the conservatory and kitchen. Thank you for a fast and efficient service. I will certainly recommend you.